Many criminal cases are not resolved with a trial. In fact, most criminal cases are resolved by way of negotiated plea. With that said, however, the decision whether to resolve a case by way of plea or trial belongs to the client. The attorney must provide the client with the information necessary to make an informed choice. If the client wants to proceed to trial after listening to the attorney's explanation of the strengths and weaknesses of their case, counsel must try the case, notwithstanding the benefits secured by the plea deal. The client cannot be forced into a plea arrangement they do not truly want. Further, the prosecuting authority normally extends a plea offer in a criminal case, but does not have to. There is no such thing as a "right" to a plea offer. There are cases in which there is no plea offer, and the defendant has no choice but to proceed to trial. As a result, any criminal matter can go to trial, and counsel must remember this as they proceed with efforts to obtain a favorable plea deal for their client. Counsel must therefore constantly view the case with an eye toward trial. Counsel must always seek to ascertain the strengths and weaknesses of the evidence against their client, and how a jury will view every material issue in the case. A criminal trial actually starts long before jury selection. At this stage, defense counsel is collecting and reviewing the evidence against their client, investigating the facts that gave rise to the charges, interviewing potential witnesses, collecting exculpatory evidence, and developing the defense theory of the case that will be presented to the jury. Defense counsel is also drafting and preparing any necessary pre-trial motions. These can include, but not be limited to, motions to suppress a client's statement or physical evidence, to compel turnover of materials that may be exculpatory, or to limit the use of evidence that undermines the defendant's position. Such motions often require courtroom testimony under oath from State or Government witnesses, and therefore afford defense counsel the opportunity to learn about the case against their client and "road test" adverse witnesses in open court prior to trial. Jury selection involves some of the most important -- and most difficult -- decisions made during the trial. Obviously, each of us have personal life experiences that cause us to view things differently. For better or worse, jurors bring those experiences with them into the courtroom. Counsel tries to learn as much as possible about prospective jurors during the questioning (or voir dire) process that precedes the swearing of the jury. Jury selection is not a precise process that can be reduced to mathematical certainty. Rather, it depends upon counsel's judgment and prior experience. The backbone of any trial is witness testimony. 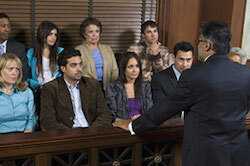 Counsel must be able to examine different types of witnesses before a jury. These include fact and expert witnesses. As a rule, the technique used to examine witnesses will vary depending upon who called that witness. A party's own witnesses must be asked more general or open-ended questions, whereas adverse witnesses can be asked leading questions. Trial counsel must, therefore, be able to "switch gears", depending upon what kind of witness is on the stand. There are many rules governing the conduct of a jury trial, and defense counsel must obviously be thoroughly familiar with all of them. But the one "rule" that counsel must always bear in mind is that anything can happen at trial. Witnesses can disappear, change their testimony from the version of events related prior to trial, or simply decide to not testify at all notwithstanding prior representations of their willingness to do so. Physical evidence can also disappear. The ability to respond to such random or unexpected events in a way that thoroughly protects a defendant's constitutional rights depends on counsel's knowledge of law and procedure, as well as their experience. Every defense attorney wants to win every case they take to trial. However, a good defense attorney will never assume that they are going to win any particular case. Because of the random nature of the process, a loss at trial is always a possibility. As such, defense counsel's role at trial is really two-fold. Counsel works diligently to prevail at trial, while simultaneously creating a record for appeal in the event that his client is found guilty. Thus, in addition to developing and executing a trial strategy geared toward winning, counsel will also make certain that the trial record reflects objections to any and all rulings that were adverse to their client's position. Those objections lay the foundation for any appeal that may be necessary. This very brief description of some of the component parts of a jury trial demonstrates that the process is long and complicated, and requires substantial skill. Only a seasoned attorney with considerable training and experience can successfully navigate this process. New Jersey Criminal Defense Attorney James S. Friedman represents defendants in criminal trials in the Superior Court of New Jersey and the United States District Courts in New Jersey and New York City. If you are seeking a criminal defense attorney who understands that not all criminal defendants accept plea deals and that a trial is sometimes necessary, call Mr. Friedman at 800-361-6554 (toll free) or contact him online to discuss your case.